Just before the Natsu Basho 2006, former Komusubi Toki, crippled with injury, announces his retirement. It is the end of an era for one who has become famous as much for his prominent side-burns as for his fierce style comprising nodowa and harite. A retrospective on the career of this likeable rikishi by Jean-François Morgillo, alias Hoshifransu, his greatest fan and originator of a site that we recommend you visit (http://tokitoki.free.fr). Toki, whose real name is Jun Tamashiro, was born on July 4 1974 in Chiba, a large dormitory suburb of Tokyo. He began his career in January 1991 in Takasago beya. He wears side-burns, just like prestigious former rikishi from the stable, such as ex-sekiwake Takamiyama and ex-Ozeki Asashio before him. 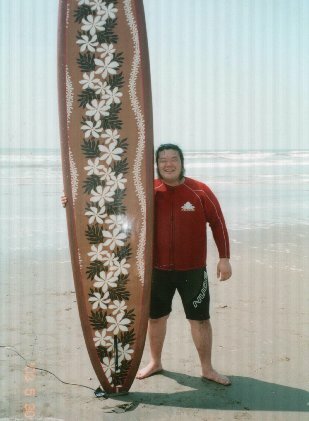 In his youth he served as tsukebito for the famous Hawaiian Konishiki. He took nearly six and a half years to reach the Juryo division in July 1997. 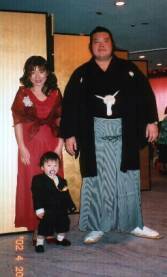 Less than one year later, he was already in Makuuchi for the Natsu Basho of 1998. With his orange mawashi, side-burns, large size, paunch, and aggressive style, Toki was very reminiscent of Takamiyama, who was the first to give him the nickname of "Elvis". Toki is also a pleasant, strapping fellow who is generous and convivial. His hobby is to go surfing with friends on the Pacific coast of Japan with his longboard, or to have a good time drinking with his mates. He carries his alcohol well, with the exception of sake, as he confided once to an NHK journalist. He is often invited to appear on TV Variety Shows or Game Shows. Toki is a good guest! Let us not, however, be fooled into thinking that Toki’s jovial personality made him a joker on the dohyo. He was paradoxically one of the most brutal rikishi, one of the least whimsical and roughest. Right from the tachi-ai, he handed out violent slaps (harite) or battered opponents by taking them by the throat (nodowa), thus keeping his distance and avoiding a possible mawashi grip. In fact, he often moved back while absorbing blows and generally ended up leaning on the back of his opponent’s neck or shoulders in order to flatten them to the ground (hatakikomi) or by unbalancing them with his forearm (hikiotoshi). Those who could not handle the nodowa/harite treatment were quickly pushed back out of the dohyo, generally by tsukidashi or okuridashi. This style is not really classical, but it is effective for those who can use it well, and Toki was a Stakhanovite at it. This mixture of harite, nodowa and vertical pressure was successful, and Toki remained a stalwart of Makuuchi division for many years, relying almost exclusively on the combination. Those who managed to resist and rapidly grab Toki’s mawashi generally won, but for the others, it was the roughest possible treatment for interminable seconds until they were able to move onto the offensive, or until Toki ran out of steam. Meeting Toki in a tournament was never a gift. Feathers were often left behind! What makes a genuine tour de force, a long-term achievement, is that Toki almost never departed from this style throughout his career. Without any element of surprise, his opponents fought knowing what treatment awaited them. In spite of their experience, range of techniques, or their rank, many fell into Toki’s trap and were forced into defeat. Preferred opponents: Ozeki Takanonami, who due to his height as well as a lack of aggressiveness, conceded 10 losses in 13 bouts against him, Shimotori (6 losses in 7 meetings), Tamarikido (4 defeats in as many meetings), Hokutoriki (5 defeats in 7 meetings) in quite a similar style, and Otsukasa (10 defeats out of 14 meetings) whom he tortured with intensity and not without a certain pleasure because of his small size. In summary, Otsukasa was his perfect victim, well within reach of his harite and nodowa! On the other hand, Toki had problems against Yokozuna Takanohana, Akebono and Musashimaru and Ozeki Chiyotaikai, never managing to beat them, also against Tochiazuma whom he succeeds in beating only once in 13 meetings, and against huge rikishi such Kotonowaka (2 wins in 16 fights) and Tochinonada (4 wins in 18 bouts). On December 18, 2000, in Osaka, a terrible event marked the career and the life of Toki. When he was at the wheel of his car, a woman of around fifty years old suddenly crossed the road at a pedestrian crossing, while the traffic light was green. In the impact, she received a violent blow to the skull and died almost immediately. Toki was destroyed by this tragedy. He apologized, expressed his deepest regret, and also honoured the victim by going to the wake and the burial. The media reaction in Japan was fiercely anti-Toki; the media talking about him like a murderer, without waiting for the conclusion of the investigation. He was required to pay a fine of ¥200,000 to the family of the deceased. 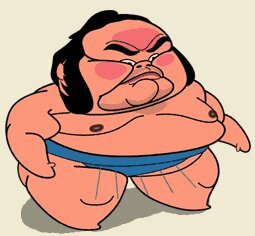 The Nihon Sumo Kyokai punishes him with a one basho suspension because, wanting to protect its champions from traffic accidents, it has recently banned rikishi from driving following an accident involving Akinoshima where a person was wounded. But the hardest sanctions that Toki came up against were how this tragedy haunted him as well as the period of doubt that followed. For days, police investigators questioned Toki at length, coinciding precisely with the period of his suspension, in order to determine his responsibility in the accident, while his heya comrades took part in the tournament. He felt very much alone, the more so as his Oyakata was hospitalised at the time and he had delegated the heya to former rikishi Mitoizumi, who had to manage this delicate business. Toki confided that he found it impossible afterwards to remain away for several consecutive days of a tournament due to injury, because he then had to relive the nightmare of the winter of 2000/2001. At the Hatsu Basho of January 2004, for example, although he declared forfeiture from the fifth day, he returned to fight in a much weakened state from the 9th day until senshuraku, losing all his remaining combats, but preferring to take part without hope of victory rather than to remain away. Fortunately life is not made up only of misfortune, and the second half of 2003 proved to be full of satisfaction for Toki. The happiest event was the birth of his second child, a little girl named Cocona, born at the end of 2003, five years after his wife Yuko gave him little Leo. He had great satisfaction also on the professional level, with his promotion to the rank of Komusubi for the 2003 Aki Basho after finishing two consecutive Bashos with a score of 10-5. As Komusubi, he didn’t do too badly, and at the start of the 11th day, he had 6 wins and 4 losses. In the end it was a shame that he finished make-koshi with a record of 7-8. The following Basho, in Fukuoka, he delivered a fine 9-6 at Maegashira 2 East, beating fearless adversaries like Kaio, Takanonami, Wakanosato and Miyabiyama. There was no doubt that his work had borne fruit. Another positive element was the merger of Takasago Beya with Wakamatsu Beya in February 2002. At his retirement as Oyakata, customarily at the age of 65 in the world of sumo, Takasago Oyakata (former Komusubi Fujinishiki) concluded a deal with Wakamatsu Oyakata (ex-Ozeki Asashio) because of a scandal which prevented him from leaving the heya to former rikishi Mitoizumi, which resulted in the creation of a very large heya of more than thirty rikishi. The introduction of numerous rikishi of great technical quality, such as Mongolians Asashoryu and Asasekiryu, from ex-Wakamatsu Beya gave good competition in training for the veterans of Takasago beya, and it is one of the factors which might explain Toki’s improvement. However, an additional test marked a new turn in Toki’s career at the end of 2003: the death of his former Oyakata, ex-Komusubi Fujinishiki. He was extremely upset. 2004 thus started badly and it continued badly. Although he tried to regain the rank of Komusubi at the Hatsu Basho, he was injured against Musoyama on the 4th day, fighting in a style which was not his own, being drawn in to fight in a yotsu position which he doesn’t normally use, winning the bout with a spectacular but fatal shoulder grip. Toki reproached himself for failing to look after himself physically: "I have muscles made for oshi zumo and not for doing shoulder throws. One should never try what one does not usually do." Toki was tough with himself, but can he blame himself for having the ambition to remain sanyaku by enriching his style a little rather than to play safe and continue to yoyo in the maegashira ranks for the remainder of his career? Can he reproach himself for having refused to surrender when his opponent seized his mawashi, and having gone all out to seek victory? Unfortunately he paid a high price for his ambition, because his left shoulder would make him suffer for months. Then, he developed problems in his back and hip. Gradually he sank down the banzuke. The trend continued in 2005. 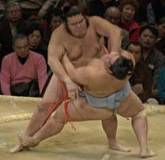 Nevertheless, his pride stirred dramatically at the Kyushu Basho in November, after he had fallen to Juryo 13 East. After three wins, he got three consecutive defeats, and many people already predicted he would fall to Makushita. He won 9 in a row and to the surprise of most observers, he took the Juryo division yusho, in spite of the pain which he tried to suppress as much as possible using painkillers. Alas, the following basho saw him sinking again in the banzuke and at the start of the Natsu Basho in May 2006 he had finally fallen to Makushita. The doctors diagnosed spinal stenosis and Toki’s prospects were considerably diminished. In fact, Toki announced his intai on May 5 2006, just before the start of the basho. He held a press conference two days later in which he declared that, to his great surprise, since he announced his retirement, he feels relieved. He could not do anything else because of the bad state of his hip, preventing him from doing any keiko at all. He thanked everyone who has supported him, in particular Takasago Oyakata and Mitoizumi, just as he is very proud to have been up as far as sanyaku. Consequently he will endeavour to help train the young rikishi of Takasago beya. Toki has been a likeable rikishi who is deeply human, and it is very sad to see him leave the world of active rikishi in professional sumo. As much because of his apparent likeness to Elvis as because of the originality of his style, his sensitive and generous nature off the dohyo, his unfailing toughness in tournaments, Toki was able to gain many fans all round the world. Without being a great champion, not having won any prizes, never having gained a single kinboshi, Toki was and will remain a very popular champion, and will be remembered for a very long time.